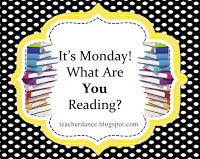 TeacherDance: It's Monday - NEW BOOKS! Cybil's Nominations open today! Go HERE to find out how and then nominate favorites! As you'll see at the end, I finished one adult book and am in the middle of two long books. What a marvelous week of picture books. I added a few to Goodreads, but here are four amazing books to add to your lists, though many of you may already know about them. Sometimes I am fortunate to get an advanced copy while waiting for the book which is out today! This book by Irene Latham surprised me. I thought it was going to be a sweet picture book, an imaginary tale between an octopus and a lonely boy, but it is much more. 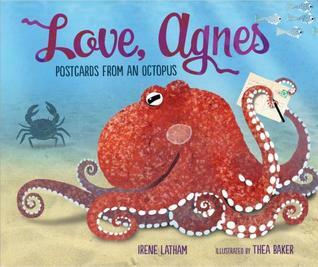 On one level, meeting Agnes and seeing how she acts through the story follows the actions of a real octopus. Also, Thea Baker's illustrations show the real look of an octopus down to the rectangular eye-shape and other ocean features are realistic as well as appealing. Irene has added more about octopuses and an "additional reading" list at the back. In the story, Agnes appears to be looking for a home to rest, but finds it blocked by, "what? ", a postcard. It's from someone named Andrew, who seems to be calling Agnes a monster and signing himself "your nothing". His mom says he can't do that, but he's going to do it anyway, apparently just not tell, but drop the card into the ocean. Agnes, alarmed, replies by postcard with indignant words and the admonition to look further for octopus information. She also receives a card from MacKenzie, a younger octopus, telling Agnes that the jar is hers, please get out. Gliding along, after such unpleasant encounters, Agnes finally finds a pleasant rock pile and, safely hidden, she lays her eggs. Within the words and the illustrations there are hints of what is coming. Agnes writes to complaining crabs that she will leave them alone if they stop "skittering and scuttling near" because her babies need rest. She signs it "Exhausted" and the picture of her shows a faded red with blotches of pink. Readers might begin to notice changes and may wonder what happened to that boy. They won't be disappointed. Agnes performs her last realistic act of caring, for the babies, and then writes one more postcard to Andrew. If you're intrigued, I am not surprised. Each page made me want to know "What now?" My final feelings connect as a mother, that Agnes does what every octopus does, has the babies and nurtures them with love. At the end, she also manages to show her caring ways by helping Andrew, a boy she will never meet. Will we act to help without thinking of future thanks? Agnes did. As I wrote in the beginning, Irene Latham has written a nuanced story that will surprise, and that you will love. Young readers may want to respond to Agnes with a postcard. I've found that I can get really new books from my library if I look for them early enough and put them on hold. Here are three I've loved. 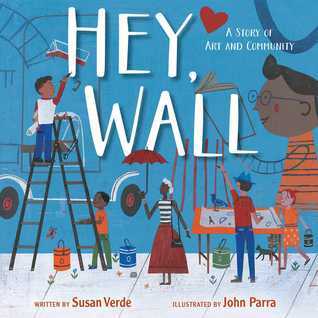 Susan Verde and John Parra have collaborated to create this wonderful book to celebrate street art and artists. A young boy strolls through his streets, often by this worn out wall, calling "Hey, Wall" telling how no one looks at it anymore, once 'full of style', but now 'cold, old, empty.' He speaks of the community, shown wonderfully by John Parra: alive and happy all through the seasons, inside cooking and eating and laughing with love and joy. He asks the wall: "Can you hear our music? We are salsa dancing. We are hip-hopping." And he has an idea, gathers everyone with stories and sketches, and they paint that wall, telling the story of the diverse and alive community. It's a call to action, and the letters from both Verde and Parra pay tribute to other cities they've known with vibrant art to see "outdoors"! I drove across the city a few weeks ago to another bookstore to see a book signing by a friend. On the old building that housed this store is an incredible mural I posted on FB, but think all you readers will love it, too. Denver has lots of beautiful street art and a long time ago, a group of my students studied certain murals in our city and created their own mural at my school. It is a marvelous thing to do with students. 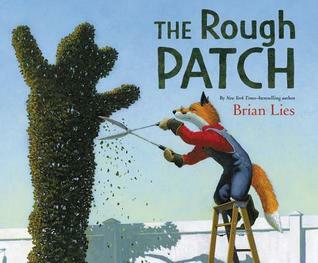 Evan, the gardener fox and his best friend, a dog, do so much together, so when the dog dies, terrible grief happens. Evan lashes out with anger and destroys the garden. When Evan spots one pumpkin vine popping up, he nearly pulls it out, too, but something in him lets it stay. He is healing, and the pumpkins arriving, then the trip to the fair means a reunion with old friends and his old love, gardening. Brien Lies' illustrations are gorgeous paintings of the feelings told, from love to grief and despair, then to love and hope again. And "who might you be?" Imagine. This time, I won't write more. 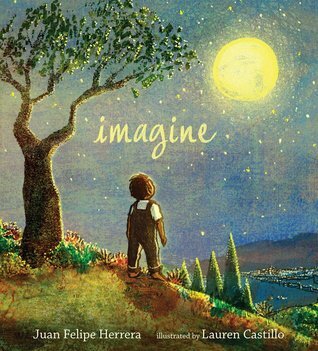 You'll have to "imagine" that Juan Felipe Herrera and Lauren Castillo have created a wonderful book, then hold it in your hands and love it, too. Other Reading: I finished The Tattoist of Auschwitz by Heather Morris and my review can be found on Goodreads. I have started an arc of The Assassination of Brangwain Spurge by M.T. Anderson and Eugene Yelchin out last week. What amazing world building I've read so far. I'm nearly finished with Resistance by Jennifer Nielsen, can barely put it down. Can't wait to find a copy of Imagine! Looks just gorgeous. Thanks for the reminder about Nielsen's Resistance! Enjoy them both, Carrie. They're terrific! I'm looking forward to The Rough Patch and Hey, Wall! That mural is gorgeous!! I've heard great things about Resistance, so I need to get that one on my list, too! Thanks for all the shares, Linda! Isn't that mural wonderful? I just had to share along with this special book. Enjoy those 2 books, Shaye! I hadn't heard of Hey, Wall. I'll definitely have to check that out! Hey, Wall is a lovely read. Hope you enjoy it. 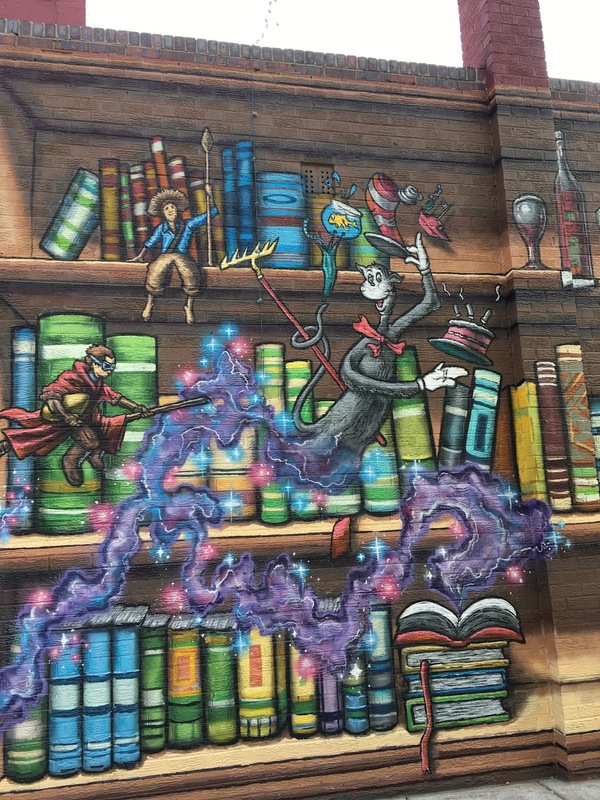 That's a great bookstore mural! Having students study murals and create their own is an amazing project. Something to think about for my school. I hope you do ponder the mural project, Lisa. My students did so much of the planning and work once they had many mentor murals to learn from, then chose a theme. 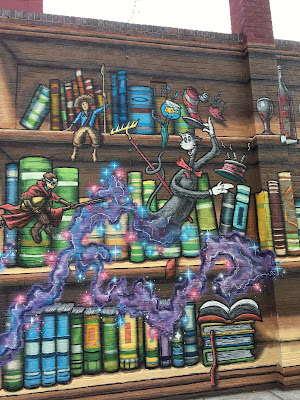 The bookstore mural was wonderful to see. I hope you like it. I found it more special every time I read it. I was able to get The Rough Patch from my library, too! But I'm still waiting for Imagine. I'm going to have to look for Love, Agnes; it looks awesome! Thanks for sharing and have a great week! Terrific that you have The Rough Patch. What an awesome and sweet story it is. Enjoy Imagine & Love, Agnes, Jana! Ooohhh, lovely books this week, Linda! I have been looking for AGNES, I'll keep my eye open. I just love IMAGINE. I think it's some of Lauren's best work. I love Imagine, too, Michele, so much that I bought two, waiting for the right time to give it away. Hope you like Love, Agnes, too. I love Lauren Castillo's artwork. That cover for Imagine is gorgeous! It is, I certainly agree. Hope you like the story, too. After reading your remarks about Love, Agnes, I went straight to my library to see if they had a copy. Then I realized it is highly unlikely they would have a copy yet. Hopefully they will bring it in soon. I will be waiting for Imagine to I guess. I hope that they'll have both soon for you, Cheriee. They are terrific. Sounds like a fun reading week for you - I haven't read any picture books in years! These look wonderful. Thanks, Sue, I imagine you might like each one of these. You're welcome, Kellee. Enjoy when you can! Your post reminded me to try again to request Imagine. Finally, it's on order in our system and I'm #3 in line when it becomes available. I'm #15 in line for Rough Patch, but there are 16 copies in the system and Hey Wall is available now. Your recommendations keep me in good books! I'm currently reading Dear Mrs. Bird, an adult book that is "joyfully uplifting and optimistic." Heaven knows we need optimism and joy in our current climate. Love, Agnes is delightful! I'm still trying to get inspired to pen an octopus poem for Irene's month of octopus fun. So glad you're working out how to get those books! Each one is such a wonderful read. I've heard of Dear Mrs. Bird and am glad to get your recommendation. Good luck with the poem, Ramona. Thanks for coming by. I'm looking forward to Hey, Wall. I liked the octopus book a little, but not a lot. I am super excited to see Imagine. I need to read it soon. I had Love, Agnes & do like it, but liked Imagine so much I had to buy it, too, Crystal. Enjoy!